View of front and right side of shaft and lower part of Cross head. 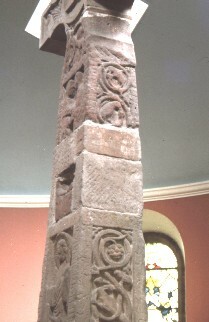 The Ruthwell Cross has sculpture on its four faces and incised capitals and runes around the panels on the four faces. Front of the Cross: bottom arm of the Cross head has an archer shooting an arrow up into the air. The top of the shaft has a salutation between two figures. (?) visitation? Right side: the shaft is divided into two panels containing scroll foliage with birds and beasts involved in the scrolls and eating the fruit.